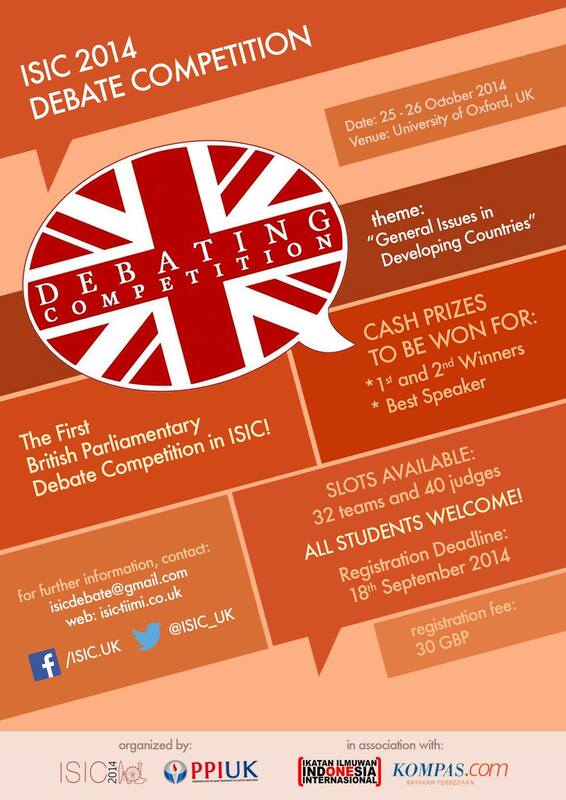 This is the first British Parliamentary Debate Competition in ISIC (Indonesian Scholar International Competition). This is an open competition, so everyone is allowed and encouraged to participate,either as participant or adjudicator. Each team will be charged a registration fee of GBP 30.00 GBP (Thirty British Pound Sterling) and a security deposit of 15.00 GBP (Fifteen British Pound Sterling) at a later date after the online registration. The security deposit will be returned on the first day of the competition. * If your institution wants to send more than two teams, then the remaining teams will be included in the waiting list. When the overall quota of participants have not met the quota, remaining participants will be drawn from the list of waiting list participants who register in advance. Each adjudicator will be required to pay a security deposit of 15.00 GBP (Fifteen British Pound Sterling). The security deposit will be returned on the second day of the competition (26 October 2014). **Registered adjudicators that have a relevant adjudicating experience may be requested by the Debating Committee to be one of the Chair Adjudicators and if you are a judge accompanying a team, then you can contact us to register before 1 May 2014. Registration can be made here. Details of the registration are available here.